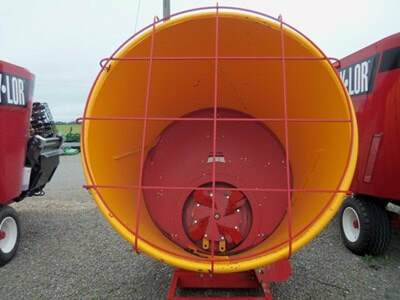 Show Me Shortline offers a 125 bushel capacity bale processor that has customers saving time and money. 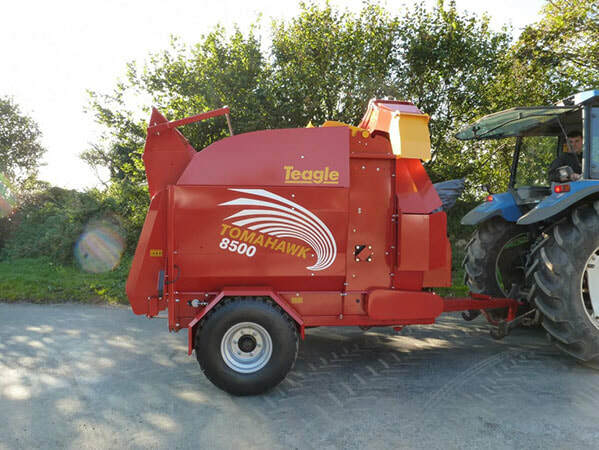 The Teagle Tomahawk 8500 bale processor is the professional’s choice when it comes to bedding, feeding or processing hay in dry or wet material. The Teagle Tomahawk 8500 has a standard swivel chute with 280 degree rotation, a single cross beater, adjustable feed slide on swivel chute model, a remote tailgate switch so you do not have to return to the cab to load bales, slip and overrun clutch on the PTO, bed speed indicator, high pressure hydraulic filter and capacity to process 125 bushels. This diverse machine can feed silage or baled hay, spread straw or corn stalks up to 80 and has a wider body for greater capacity and easier loading of 5ft wide bales. This machine is industrial grade durability because of the wear resistant steel plate in the fan housing. Again, this machine is suitable for corn stalks and will process 2 5ft rounds bales or 2 6ft square bales (with extension). It will chop to between 4-6inches after processed. The maximum blow distance on the Tomahawk 8500 is 80ft. it will handle wet or dry material. So if you want to save on labor and material costs for bedding, reduce waste and increase milk or beef production by feeding, or improve TMR mixer efficiency and stimulate digesting by processing your hay or other material, look no further than the 8500 Teagle Tomahawk bale processor. If you have a feeding, bedding or processing need, wet or dry material, round or square bales, Teagle has a machine for you. This category of bale processors produces 64,500 chops per minute and can process 6 tons an hour for of straw for TMR mixers or bedding. These units will handle square or round bales. Chop short/spread long at the touch of a button. The Dual-Chop system incorporates a set of retractable blades that can be repositioned at the touch of a button, changing straw output from short chop (around 4cm) to no chop, and back again when desired in a matter of seconds. The Tomahawk 9500 is ideal for farmers where a combination of maneuverability and high capacity is required. The Tomahawk 9500s wide body and twin cross beater ensure easy loading and large capacity. Large diameter fan in a hardox housing spreads straw up to 72’ and feeds clamp or chopped bale silage. Owning a feeder/bedder can save you labor costs because one person can now easily do several jobs, one machine can do two jobs-bed and feed. And preprocessed straw for mixer wagons improves TMR mixer efficiency by reducing processing time. 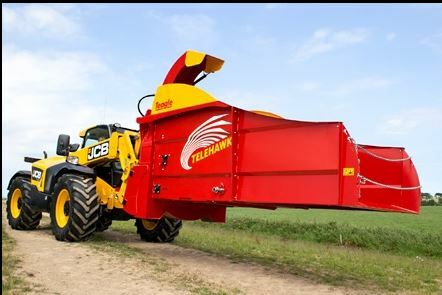 The Teagle Tomahawk 1010 model is a trailed bale processor that will handle round bales up to 5’x6’, silage and dry material and has a blow distance of up to 80ft. It has electric and hydraulic controls, duel cross beaters and a minimum PTO of 90HP. The 505M is a straightforward processing range that is made for straw and is a box model that will blow straw up to 30’ and can discharge on one or both sides of the tractor. The blades or hammers chop dry material until its small enough to pass through the holes in the screen. Other models in this category include 404M, 505XLM. 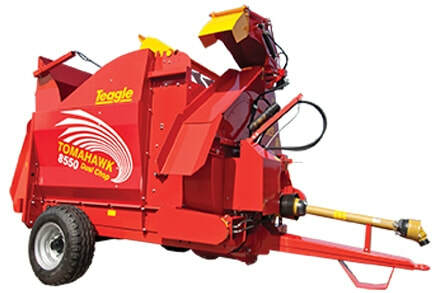 The Telehawk is a straw blower that allows you to access all areas with its rotating 280degrees swivel chute that can deliver straw to either side or in front of the machine. -Round or Rectangular Bales - Self loading operation, no tractor required. -Save Straw - Bales are thoroughly teased apart. -Excellent Visibility - Front mounted for optimum visibility of the bedding operation. -Less Stress - Machine weight is close to the headstock. ​-Improve Animal Comfort - Evenly spread straw up to 13.5m in bedding areas.